With the paws of a friendly Rottweiler firmly planted on the reception counter, guests checking in at the Summit Lodge are immediately aware they’re in for a dog-friendly experience. The three-year-old gentle giant, Talitha, isn’t the only canine you’ll see gracing the Whistler boutique hotel: there’s also Astro Boy, a Shiba Inu employed in the in-house ski and bike tuning centre, and Micah, the husky-cross, who shares his adventures on its social media channel. Talitha, the very sweet dog behind the reception desk at the Summit. The independently-owned hotel is one of many in the resort town that touts itself as dog-friendly, but unlike many others, it’s free for your pup to stay, and offers amenities catering specifically to dog owners. Pet perks at the Summit Lodge (voted best ski boutique hotel in the world in 2014) include a doggie treat basket in your room, a plush doggy-bed and food bowls. 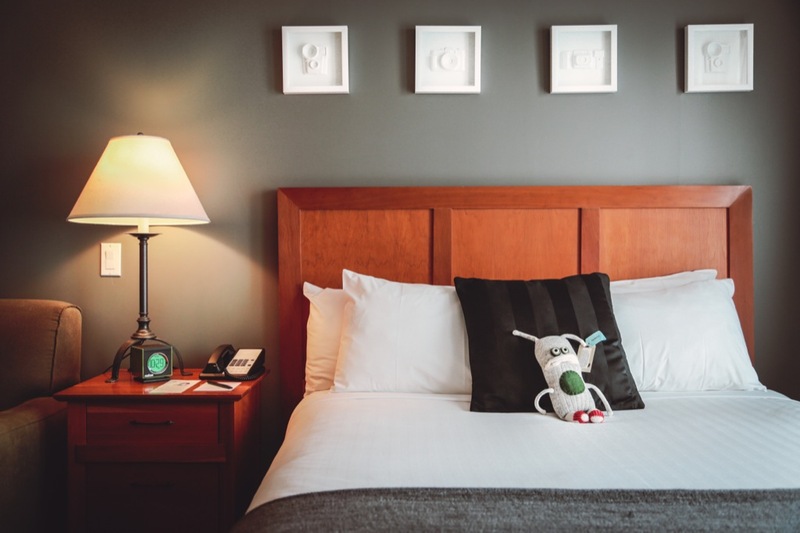 Oh, and there’s cute adoptable “ugly sock monsters” on the beds, with a portion of the sales going to WAG (Whistler Animals Gallore), the local shelter. Did I mention they have a lobby deluxe hot chocolate bar and free bike and snowshoe rentals? The Westin Whistler is another super dog-friendly hotel, and it’s made a big push of late to become a go-to destination for travelling pet owners, including hosting the annual Woof Weekend. Not only can dogs stay for free, the hotel provides “Heavenly Dog Beds,” feeding bowls — and they even offer doggy room service meals if you’ve forgotten your kibble. Not to mention, their outdoor hot tub is spectacular. 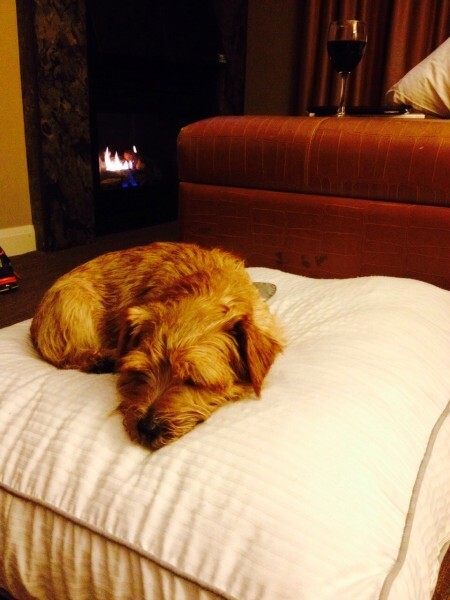 Murph enjoying the heavenly bed at the Westin Whistler. With most of us glued to our mobile devices and work emails, there are few times in daily life where you can unplug. Like, really unplug and get back to nature. 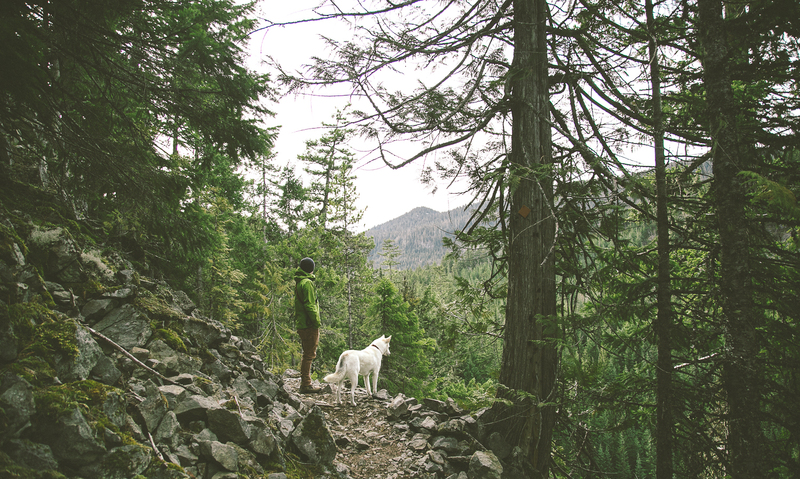 Whistler is the perfect venue for packing up a picnic and hitting the wilderness with your pooch. There are hundreds of hiking trails in the area, and tons that are dog friendly. One of the prettiest is Joffre Lakes, a series of glacial lakes that get more beautiful the higher you climb. It’s a tough climb — about two hours straight up — but it’s worth it as you reach the Matier Glacier that rises above the third lake. For a very different adventure, hop in the car for a short hop on the highway to the Parkhurst Ghost Town, a former logging town on Green Lake. Alternating between boulders and alpine meadows, the trail pushes you past abandoned cabins, abandoned tractors and ancient machinery. Here’s a list of more dog-friendly trails in the Whistler area. Before hitting the great outdoors, head to Green Moustache and fuel up with an organic smoothie packed with kale and goji berries, or a cold press juice. Their collard green veggie wraps (with a mouthwatering cashew dip) are the perfect packable hiking snack. 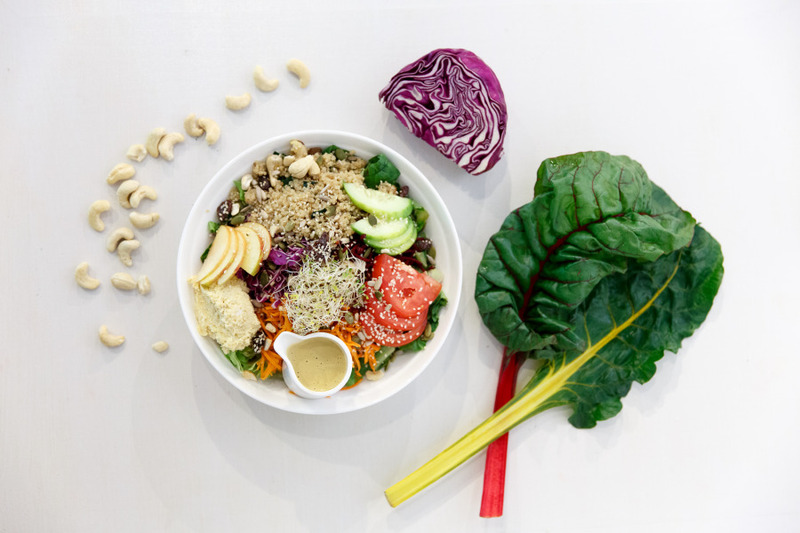 The outstanding Buddha Bowl at the Green Moustache. Feeling a bit more indulgent? Visit Pure Bread in Whistler Village or Function Junction for a Stumptown coffee and decadent pastry, cake, scone, cookie, brownie, galette or croissant. There are dozens of sumptuous treats to choose from. Highlights: Try their Nutella brioche, peanut butter blondie or “Crack” bar. Whistler Village is packed with sunny patios that, thanks to outdoor heaters, stay open through the chilly winter months as well. Whether you’re searching for the perfect apres-ski Caesar or an authentic Al Pastor taco, most village haunts are totally cool with you tying your pooch to the patio while you enjoy your meal. Many restaurants provide water dishes and treats too. The dog-friendliness doesn’t stop when the meal ends: Most stores in the area will also let you bring Fido inside while you shop. 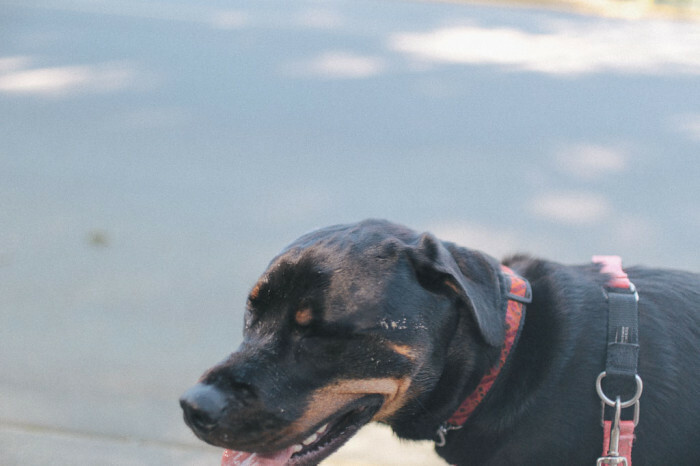 Whistler has three great designated off-leash dog parks (Alpha Lake, Lost Lake and Rainbow Park) that let you exercise your dog while taking in stunning mountain scenery. With nearly 100 kilometres of trails to explore, Lost Lake Park has a designated “Canine Cove” beach perfect for stick throwing. Rainbow Park sits on Alta Lake and boasts spectacular views of Whistler and Blackcomb mountains. It’s accessible through the Valley Trail. At the south end is Barking Bay, a great grass lawn dog area with access to the swimming dock. Would rather have a sleep in and relax? No problem. Summit Lodge packages include a two-hour complimentary walk with your weekend stay. Or get the gals from Alpine Dogs to take your dog for a pack walk. As dog-friendly as Whistler is, there are going to be times on your mini-break where it’s just not appropriate to have your dog along. And that’s okay. Whistler Dog Sitting and Alpine Dogs can come to your hotel to make sure your dog is comfortable and entertained (and not barking) while you head out and explore the town. For $15 per hour, it’s a lot cheaper than boarding your dog for the weekend in the city. Both companies also offer dog walks and adventure hikes. When Fido is taken care of, now it’s time to Treat Yo Self. After those epic hikes and dog walks, locals and visitors alike love a relaxing soak in the 20,000 square foot outdoor spa at Scandanave Spa, just five minutes north of the Village. Break the bank and indulge in one of their signature Swedish relaxation massages. One of the biggest perks of staying in a luxury hotel is the amenities it offers, but most visitors pack their stay with so many activities they don’t enjoy them properly. With luxury doggie loungers for pooches and heavenly beds for their owners, both the Summit and Westin make a convincing argument to enjoy at least part of your mini break staying in. Both hotels offer suites with gas fireplaces, a living room and kitchenette, meaning your hotel can really be your home away from home during your stay. 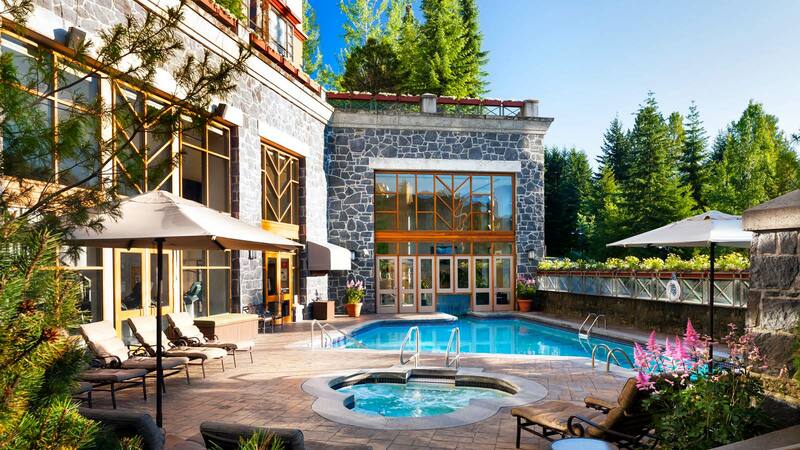 The pool and spa at the Westin Whistler. Start your morning with breakfast in bed, perhaps with a mimosa, before heading off to the gym for a light workout. If that’s too active, schedule some time at the spa for a mani/pedi, facial or the spa. Take a dip in the pool or just give those tired muscles a soak in the outdoor hot tubs. The Summit Lodge has an outdoor firepit area perfect for meeting other travelers and brainstorming the perfect activities to try the next day. The Summit has deemed April Dog Month. From April 6 to May 30 its offering a special rate and sPETactular Getaway packages ($275 for a weekend, including parking). The Westin has special rates for B.C. residents, starting at $189/night, which includes complimentary self-parking and WiFi. Proof of residency required.